I'm trying to build a Raspberry Pi into an old toy phone and use the GPIO pins to read the numeric pad (this part is working) and attaching the RPi's output to the built-in speaker. The speaker says "8 Ohm" / "0.25 W" on its back. For interfacing with the keypad matrix (and "off the hook" switch), I'm using these GPIO pins: 15, 13, 16, 11, 12, 18, 22, 8, 19, I'm also using pin 1 (3.3V) and pin 17 (3.3V) for the switch-style connectors. The audio output so far is working using the built-in ALSA device, but the output volume from the 3.5mm headphone jack is too low. I've researched a bit on the web, and there were some suggestions of amplifier boards or something. Is there an easy way to amplify the headphone output for the speaker in question (8 Ohm, 0.25 W) and can I power this amplification from e.g. 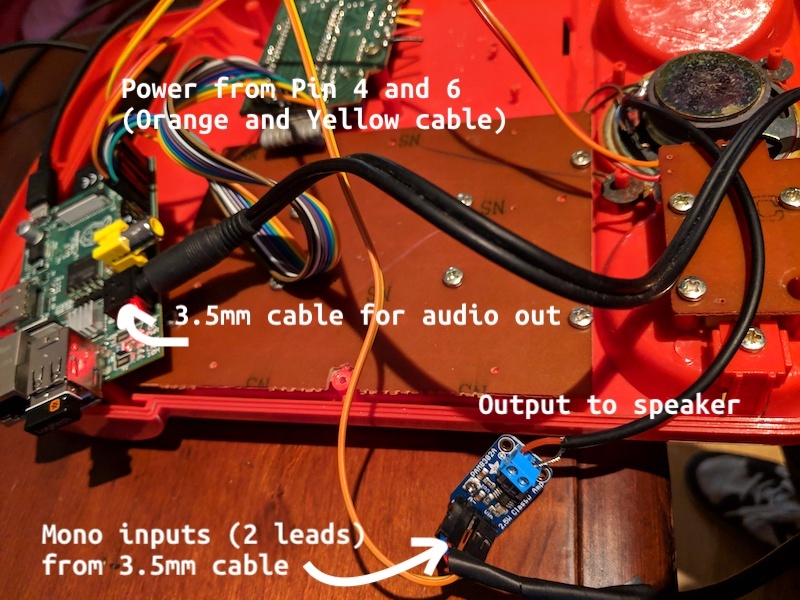 the 5V output of the RPi or what would be the best way to get good volume out of the speaker (the quality isn't as important, it's a speakerphone style speaker of a toy). 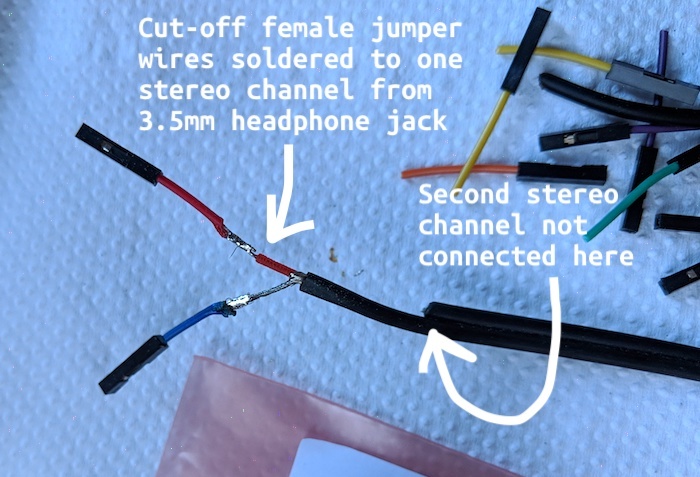 Or would outputting PWM over a GPIO pin and connecting that directly to the speaker be preferable to the 3.5mm headphone jack? I can switch from the Pi 1B that I'm using at the moment to a Pi Zero, if that makes things easier? This is loud enough for my use case (there's still some headroom, but I don't need it THAT loud) and it works nicely off a battery pack as well. I've researched a bit on the web, and there were some suggestions of amplifier boards or something. Yes, this is how wired audio generally works (i.e., it is not a Pi issue), although for young people in the age of bluetooth that may be arcane. Wired audio sources (e.g., your smartphone) output low level signals into an amplifier, and the amplifier outputs a (much amplified signal) to speakers. This is why if you plug your smartphone into that speaker, you won't get an acceptable volume either. The speaker needs an amp; either there was a primitive circuit for such in the toy or the source was sufficient. Bluetooth speakers, TV bar style soundsystems, and subwoofer combos all include an internal amplifier, which is why you don't need an external one for those. Traditional sound systems often have a "receiver/amplifier" which includes a radio, a bunch of cable inputs, a dial to select an input, a dial for the volume, and a digital display. The speakers they are wired to are like the one you are dealing with -- no internal amplifier. Anyway, all-in-one stereos ("ghetto blasters", etc.) often also have an extra AUX input you can use. If you find one, try plugging the pi into that instead until you decide what to do with your little speaker. Which is something you'll have to research if you want to get an amp. Not the answer you're looking for? Browse other questions tagged audio power or ask your own question.